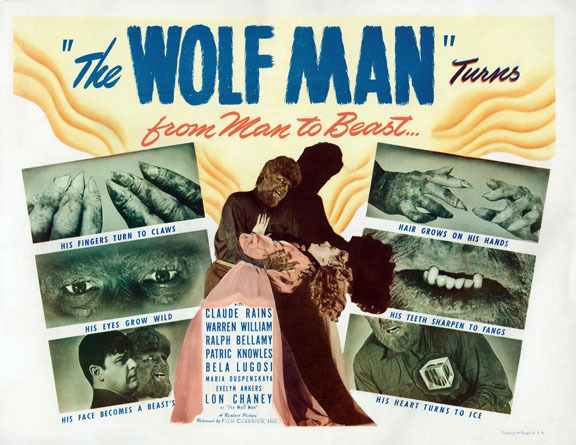 This was one of the few Universal monster movies not based on a book, and writer Curt Siodmak invented quite a few of the things we now think of as werewolf canon — like silver bullets, the bite of the werewolf transferring the curse, and even the idea of the full moon bringing on the transformation. (He also penned the folk poem quoted in the movie: “Even a man who is pure at heart and says his prayers by night, may become a wolf when the wolfsbane blooms and the autumn moon is bright.” It’s in every Universal werewolf movie that followed, tho’ they changed the last line to “the moon is full and bright.”) Missing entirely from the movie is the scripted scene were the Wolfman was supposed to wrestle a bear. 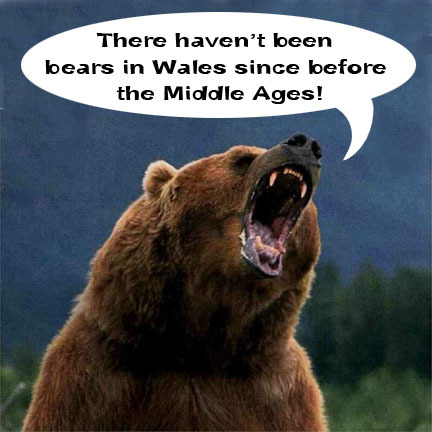 (Yes, one of the lesser known inhabitants of Wales that.. um.. no one has ever seen there.) Apparently the bear had trouble finding his motivation that day (or maybe he thought a bear turning up in Wales was not believable) and chased leading lady Evelyn Ankers right off the set, which pretty much scrapped the scene. The Wolfman, as played by Lon Chaney, was a perfect candidate for the Monster Martyr paintings I was working on — talk about being in the wrong place at the wrong time! 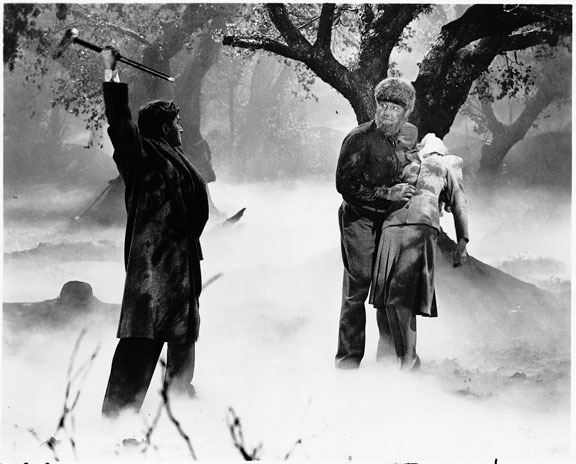 Larry Talbot (Chaney) had the extreme bad luck of rescuing a girl being attacked by a werewolf (transforming gypsy Bela Lugosi). 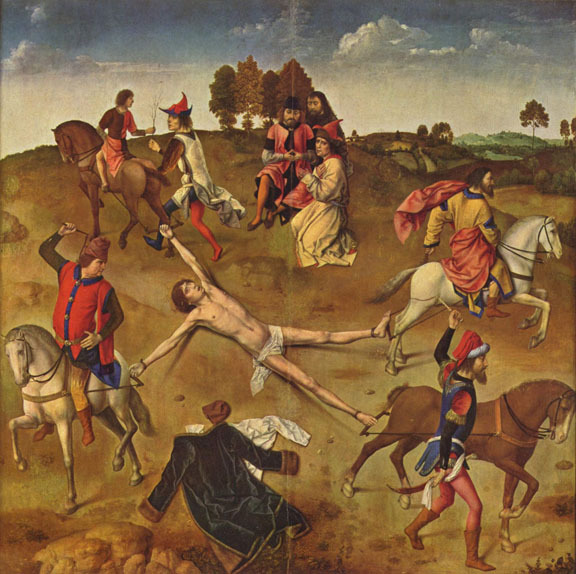 Talbot was able to defeat and even kill the creature because of the nifty silver wolf’s head cane he’d just bought from a cute gal he was flirting with at the local antique shop (the aforementioned bear-bait, Ankers). 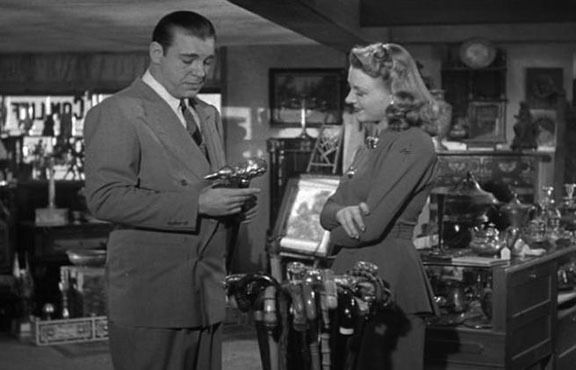 Ah, the old “I’ll buy something from your silly shop and then we can have dinner, right?” ploy. 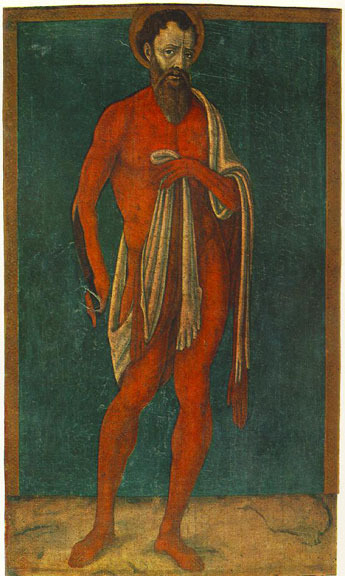 St. Bartholomew the… well they basically peeled all his skin off. Larry Talbot/Chaney wasn’t a monster of his own making or choice — he wasn’t experimenting with powers beyond his understanding or pushing the boundaries of science or dabbling in witchcraft — he became afflicted with something he couldn’t control, and was put to death for it. 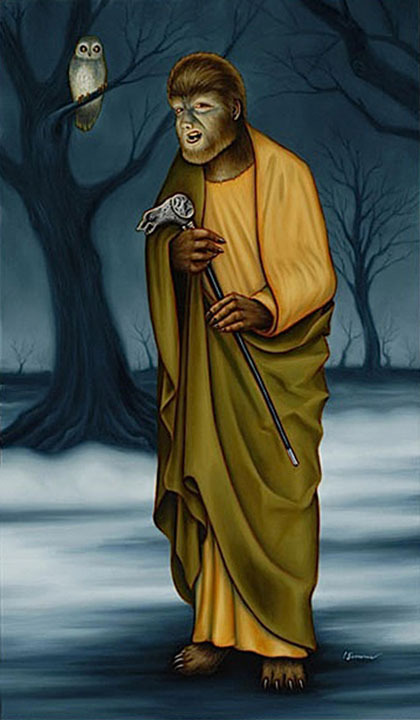 In my painting “Song of the Owl”, the Wolfman is carrying the object of his martyrdom, the silver wolf’s head cane that killed him, and has as his companion an owl. Sacred to the Greek goddess Athena, the owl has long been associated with wisdom but because it’s nocturnal (plus that very unnatural head swiveling thing) it also has a long history of creeping people out and is considered a funereal bird and bad omen. 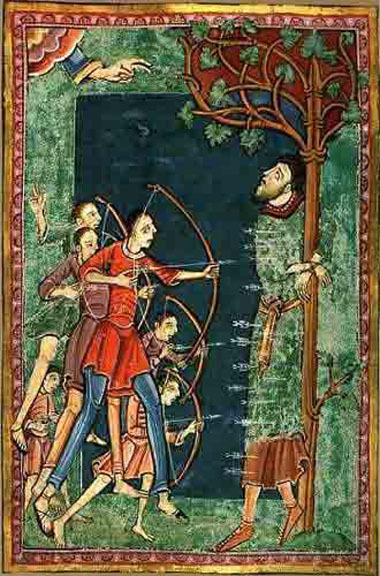 (In the Holy Scriptures, Joel lists the owl among the “impure animals.” What bunk.) I absolutely adore owls (as evidenced right here) and in my painting the owl is a messenger bird, capable of traveling between the worlds of the living and the dead. 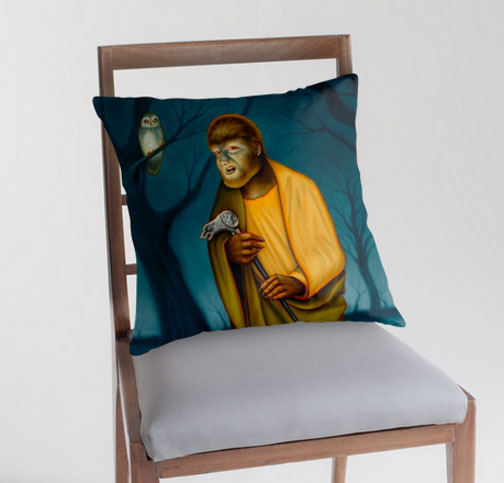 If you want to bring a little of this wolfie goodness into your home, you can snag yourself something plush and yummy right here: “Song of the Owl Throw Pillow” — promise he wont scratch up your furniture! Happy Howloween!